See our class in action. 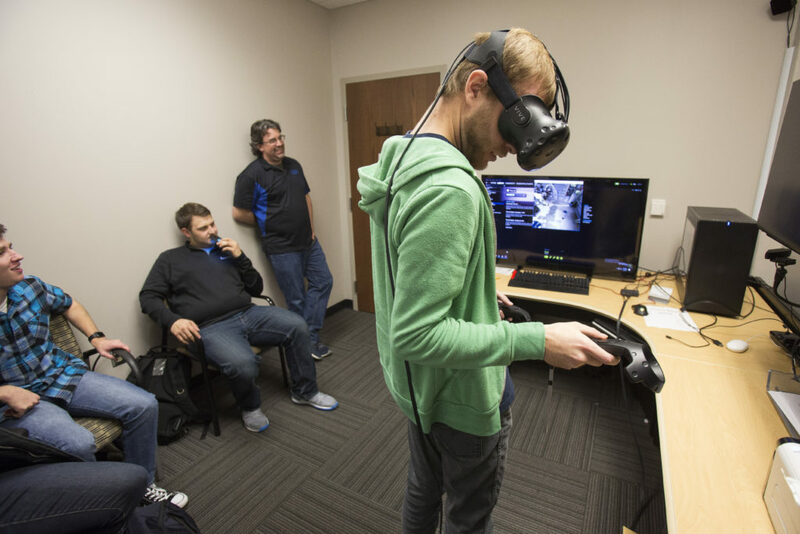 Virtual reality may be a young field, but the possibilities for the platform are endless. 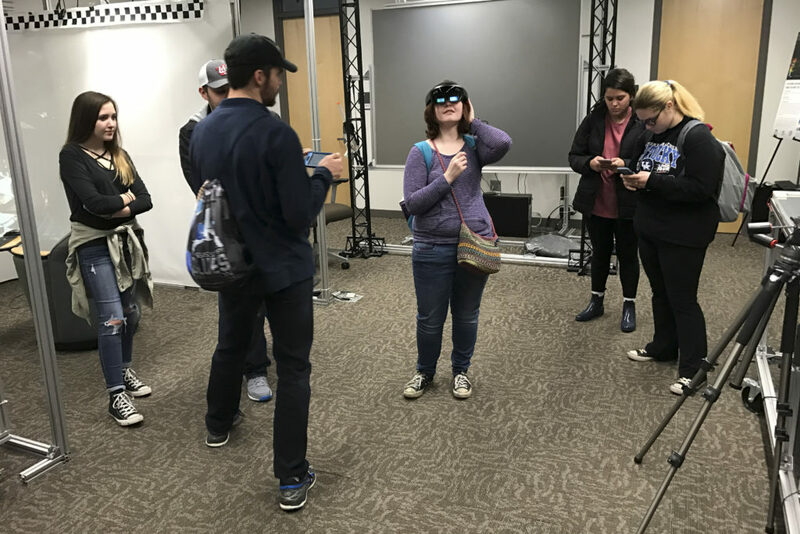 One class at the University of Kentucky used the technology to meet in class rather than in its regular classroom. 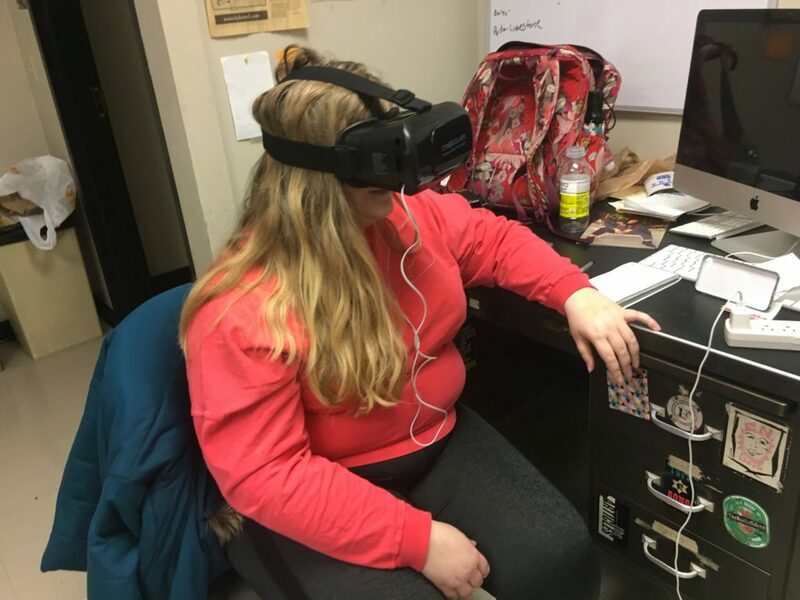 Students in David Stephenson’s JOU 497 class, also known as virtual reality storytelling, met in groups on a VR chat social network called VTime to discuss their own VR projects for the class in early February. 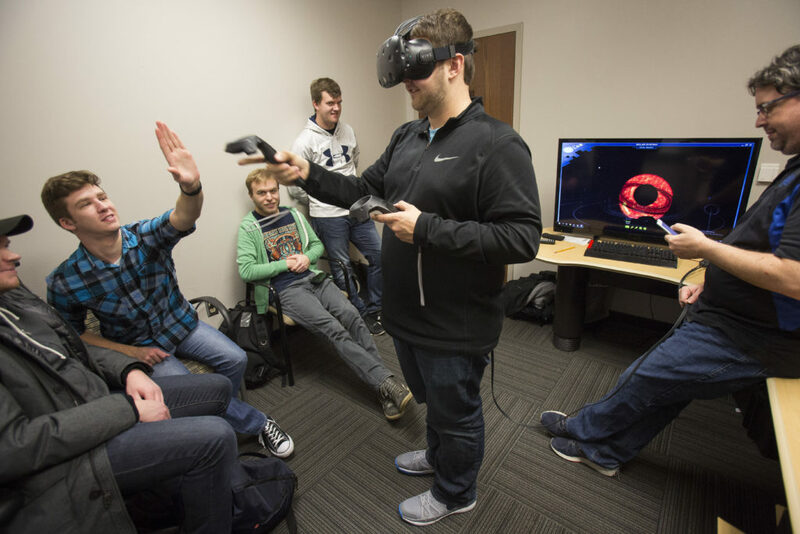 Instead of meeting in their regular computer lab, students attended class in restaurants, their beds and even the Kentucky Kernel office. Stephenson met in chat rooms with two to three of members of the class at a time. He has taught previous sections of JOU 497 but this class was the first to meet virtually. VTime is over two years old and allows users from across the world to meet in virtual chat rooms based on environments like an executive air jet or a campfire in the woods. As of now, the platform only allows for a total of four users to be in a room. VTime is available for iPhones for free. 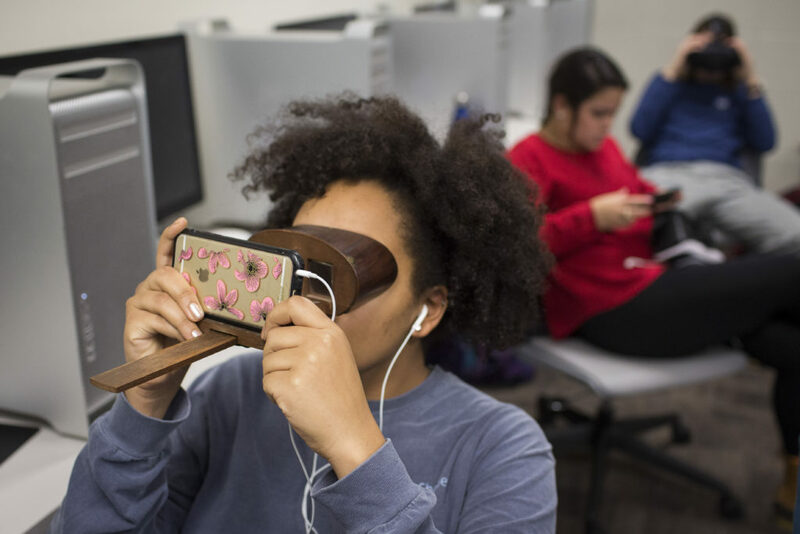 The app works with Google Cardboard viewers or similar VR viewers. Aaron Porter, a student within the class, got on VTime while he was eating lunch with a friend. He enjoyed the experience because it showed that people can connect in the same space without actually occupying the same space. He said that VR opens up many new opportunities for education. 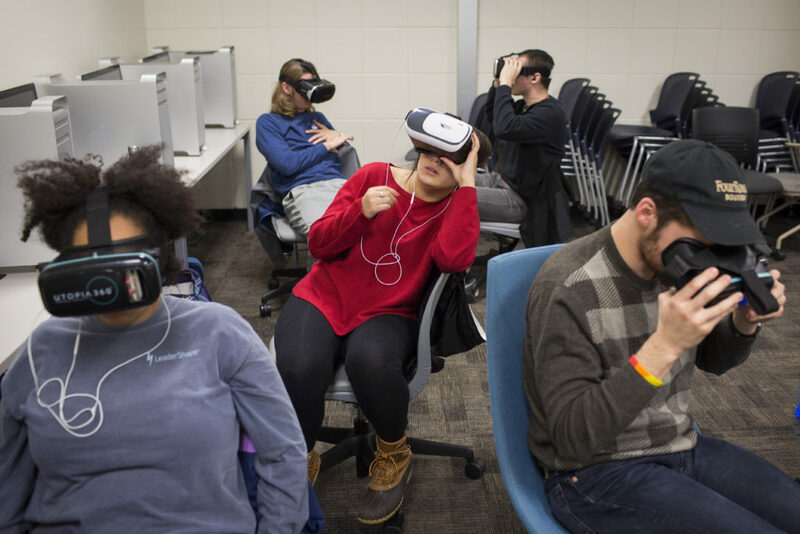 “You can have a class of thousands of people put them all in one class while a professor teaches it… There would be people all across the county—all across the world—that could see it,” Porter said. 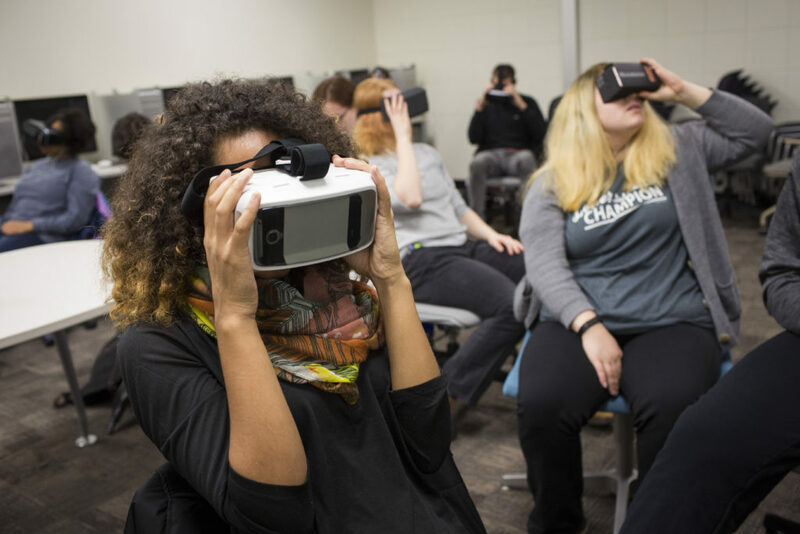 Porter said that the class discussed ways VR can be applied to education. 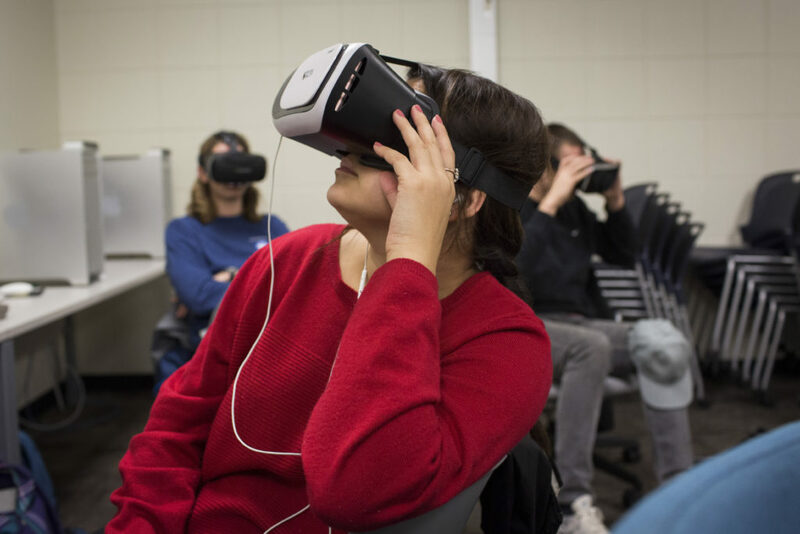 For example, some medical students at the University of California San Francisco are using VR in their classes to better understand anatomy and forgoing older methods such as cadavers and textbooks, according to the university’s website. Savon Gray, another student within the class and Porter’s partner, said he liked being able to attend class from the comfort of his own bed. He liked switching between scenes, such as the banks of river in a forest and a space station. Gray said the experience seemed so real that he “could feel the water between my toes.” He could also see the body of his avatar, which added to the immersion. He said the experience allows for a stronger connection in communication. “It’s kind of like FaceTime, except for you are looking at your virtual person than your actual face,” he said. 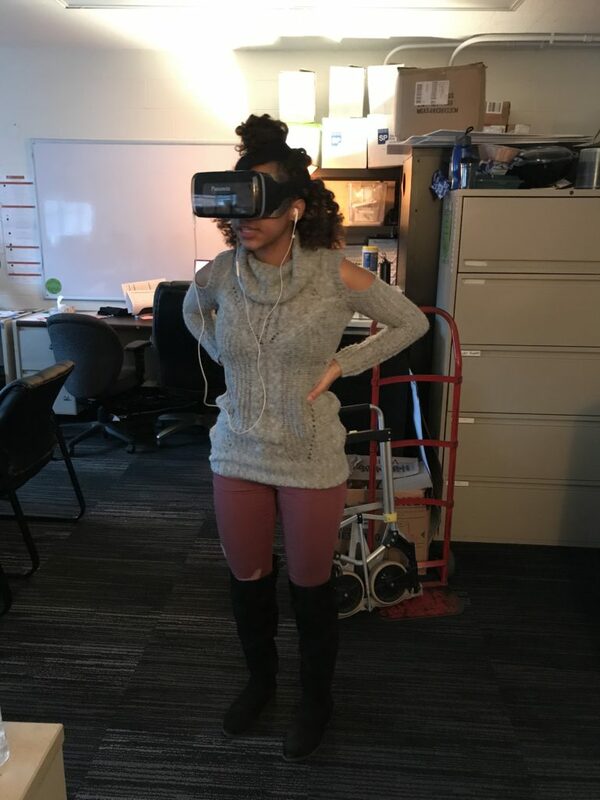 Naliah Spencer, a student in JOU 497, uses VTime to meet with other students while she is in an office. 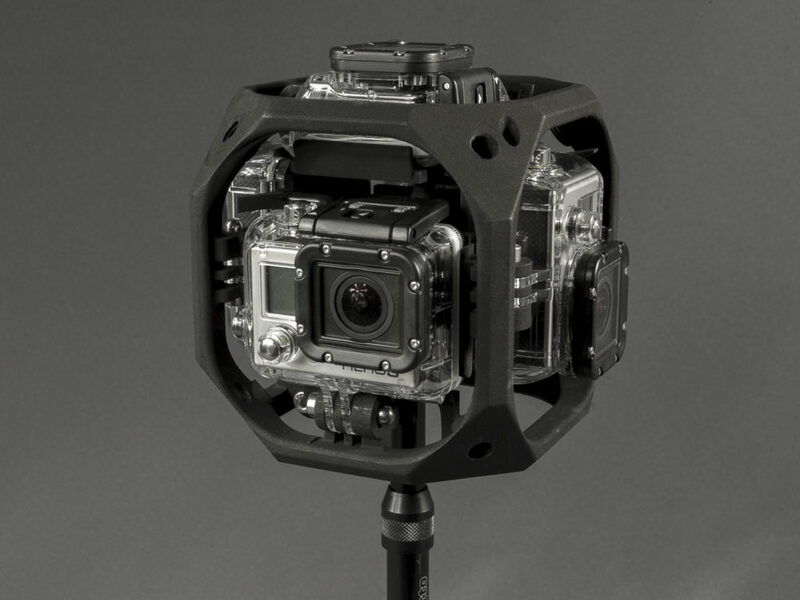 According to an article from Reality Technologies, social networks like Facebook are exploring VR-based forms of communication. The social media giant’s plans unveiled in 2016 used the Oculus Rift headset and allowed users to create their own avatars. 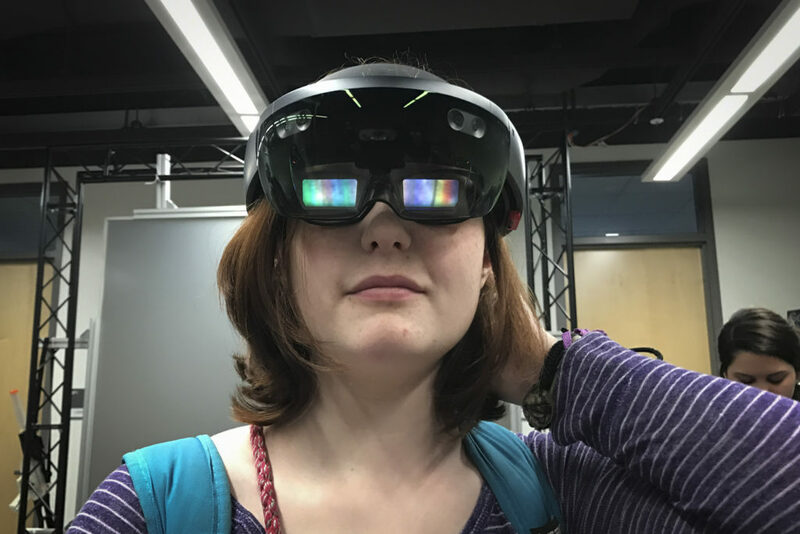 The same article also mentions that Google is exploring ways to connect people within VR and that the company sees VR’s future is in immersing users both physically and emotionally. Our class spent an afternoon wandering around sections of campus to try out a 360 GoPro rig we borrowed from the Media Depot. 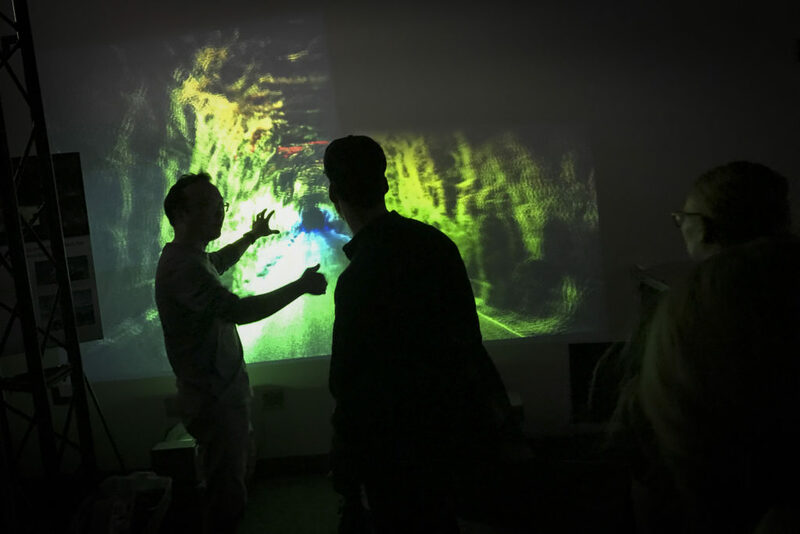 The first three weeks of class were spent exploring, and more importantly experiencing, the ways the virtual reality and augmented reality are being used for gaming or visualization. 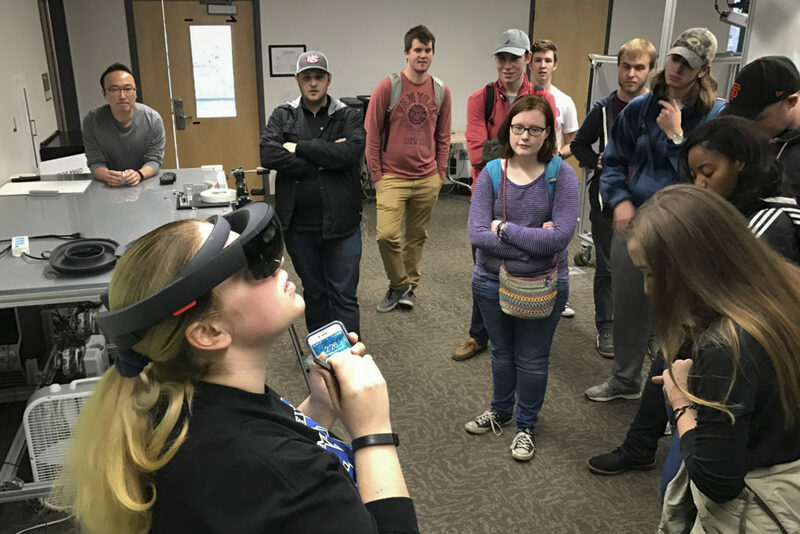 Thanks to Nathan Stevens for giving us the afternoon with his HTC Vive and also to Dr. Song for a tour of the visualization lab in the Computer Sciences Department where we also were able to test out the new Microsoft Hololens.